Sunday was the last day of my Big Gourmet Garden Aussie Adventure. Gourmet Garden kindly gave Alberto, Patricia and myself tickets for the Noosa Food and Wine Festival. We spent the day munching all sorts of delicious food samples in the main marquee and enjoying chilled chardonnay and pear cider in the sunshine. 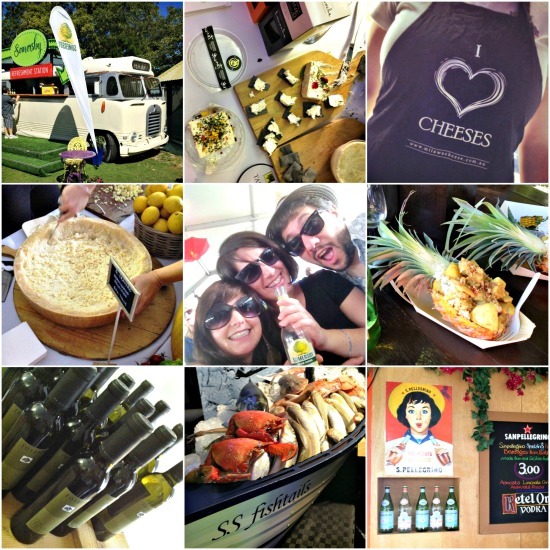 Some of my favourite photos from the Noosa Food and Wine Festival. It was a glorious day so we decided to have one final trip to the beach. As I lay on the white sand, I felt incredibly blessed to have had this incredible opportunity. Never in my wildest dreams did I think blogging would land me the chance to work with amazing brands like Gourmet Garden, experience Australia and swim in the warm Pacific Ocean on the other side of the world. Never ever ever. One final trip to Noosa Beach before home. A 'pinch myself' moment. The three of us decided that barramundi and chips (a typical Aussie dish) at Noosa Surf Club would be the most 'keeping it real' meal to end to our stay in Noosa. There was a mannequin dressed as a lifeguard at the entrance to the surf club which we found very amusing to pose with. We might have spent more time with him than in the actual restaurant. We skipped dessert at Noosa Surf Club in favour of ice-cream at Nitrogenie. They make ice-cream 'live' in front of you using a kitchen aid and lots of liquid nitrogen. I think the video below best illustrates how it works! Monday morning was Eggs Benedict for brekkie at Aromas before a cab to the airport. I had just enough dollars to buy some more souvenirs at the airport for my boys, including a stuffed koala which says 'G'day' when you press his tummy. He was great company for the 24 hour journey home. I had an absolute blast in Noosa, but after over 7 days away from home I was missing the three men in my life. It was so great to see them at Heathrow, they had even made a little sign for me welcoming me home. I arrived home at 7.20am - just in time to take Joshua to school! Re-united with my babies at Heathrow airport. Here's a little video I made on my last day in Noosa, mainly about the food and wine festival. I have pasted some link to more posts about my amazing trip to Australia below. Thanks for reading!